The American Society of Veterinary Animal Behavior has joined the overwhelming chorus of veterinary and other expert opinion about breed bans: They don’t make communities safer. 1. Statistically, breed “is not predictive of the risk of aggressive behavior.” Instead, they say, dogs should be evaluated individually. 2. Breed identification based on looks is notoriously inaccurate. Study after study shows that even veterinarians and shelter workers have a terrible success rate at identifying breed in dogs based on their appearance. Behavior should be evaluted individually, not on how a dog looks. 3. Dogs usually bite because they’re afraid, not because of breed. Owner behavior and how the dog is housed are also important triggers of aggressive behavior. 4. Areas that impose breed bans don’t see a decrease in dog bites or dog agression as a result. In fact, many communities have seen an increase in these incidents, and have subsequently repealed the bans. The complete statement, with citations to studies on which it’s based, is available here. Photo: With my colleague Melissa Franklin Bain, DVM, DACVB, MS of the American Veterinary Society of Animal Behavior at the 2014 AVMA Convention. 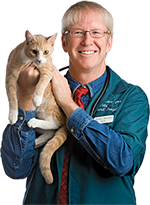 Dr. Bain is also head of the Clinical Animal Behavior Service at UC Davis.